This was a difficult layout for me to make because of the subject matter. I hope that I am able to give you some ideas for getting your challenging stories into your scrapbooks! I think that almost all memories are important and should be remembered, if only for the lessons they have taught us. For me, making this page about my Grandma helped to bring some closure to what is still a sensitive topic for me. She had alzheimer's disease and it was so hard to recognize her by the end of her life. 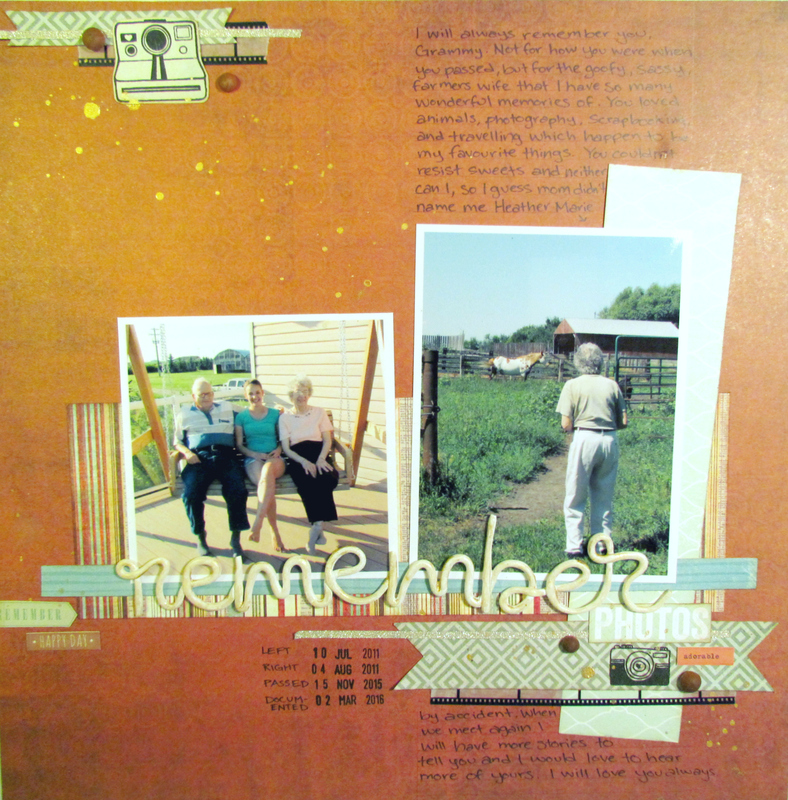 If you have a difficult story that you would like to scrapbook, I think you will know when you're ready. The other day I had a sudden feeling that this was the page I should make and I am so glad that I did. My only tip here is to know and understand your feelings about your difficult topic so that you can recognize when you are ready to scrapbook it. At the end of the video I discuss a few tips for journaling these hard times. I normally just wing my journaling and say what first comes to mind, but with this important page I made a note on my phone so that I could pre-plan what I was going to say. This helped me to keep my writing focused. I also penciled in some journaling lines so that I could keep my text straight and I would recommend using an erasable pen or penciling in the words first. These are all things that I normally wouldn't do, but for a difficult topic I found it helpful to try these out, so that I didn't have to worry about the aesthetic of what I was doing. I hope these ideas help you to scrapbook some of your more challenging stories and please check out the video for a few more ideas! Thank you for stopping by today, I hope you have a great weekend! thank you for sharing this beautiful layout. I love that you talked about this difficult topic. Did you see this beautiful collection from simple stories "heart". I think its great for scrapping and memory keeping for exactly those times in our life!. even though its hard to do, I think you did great and I really like the TWO clusters. Thank you for your comment, Sussane! I have seen parts from that collection and it is really beautiful, I might have to buy it. Thanks for the idea!